Peacock feathers. There’s just something about them. They’ve just got that snappy, snazzy, razzle dazzle kiss-my-foot-and-call-me-Your-Highness pizzazz about them. This time of year a peacock feather centerpiece or side piece can really jazz up a tablescape as well as add texture, height, and implied motion. No table linen or placemat for this one. The natural wood of the dining table just felt right. 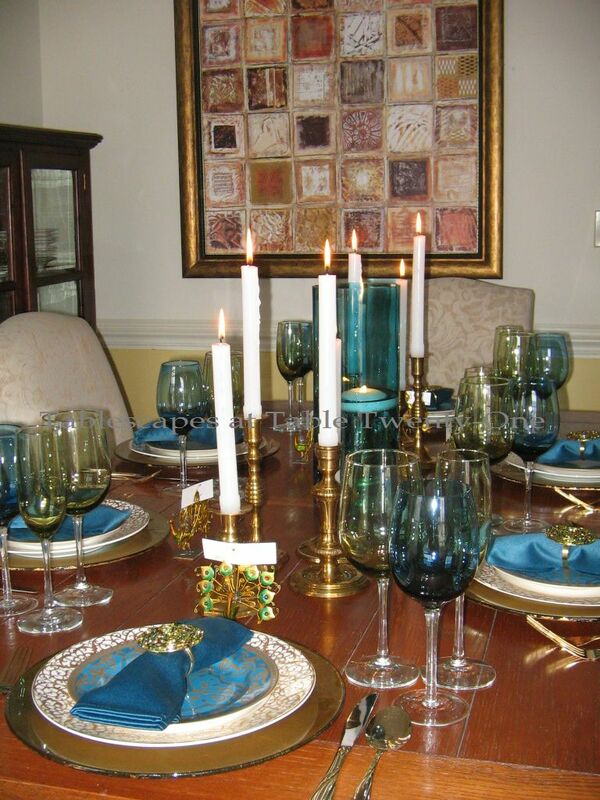 What I did for this tablescape, however, was to mix colors and china patterns to mimic the pageantry of the peacock. A goldleafed glass charger is the foundation for an American Atelier “Florentine Gold Scroll” dinner plate topped with a 222 Fifth “Ornamental Scroll” salad plate. The white in the dinner plate helps to break up the heavy concentration of color in the place setting. 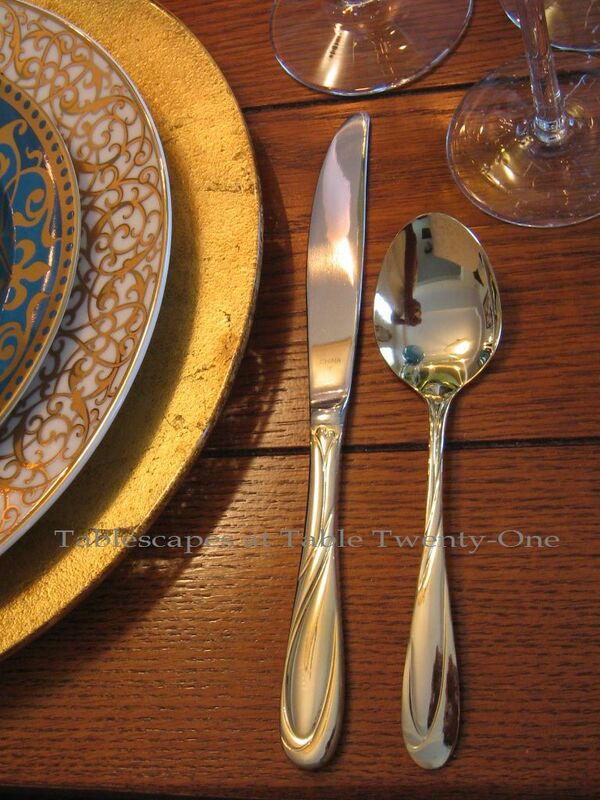 This goldtone flatware really gets a workout around here in the fall and winter months! A mix of teal blue stems from Stein Mart and Dollar Tree green stemware pulls from the colors of the male peacock’s plumage. I found these jeweled peacock place card holders at Tuesday Morning many years ago. 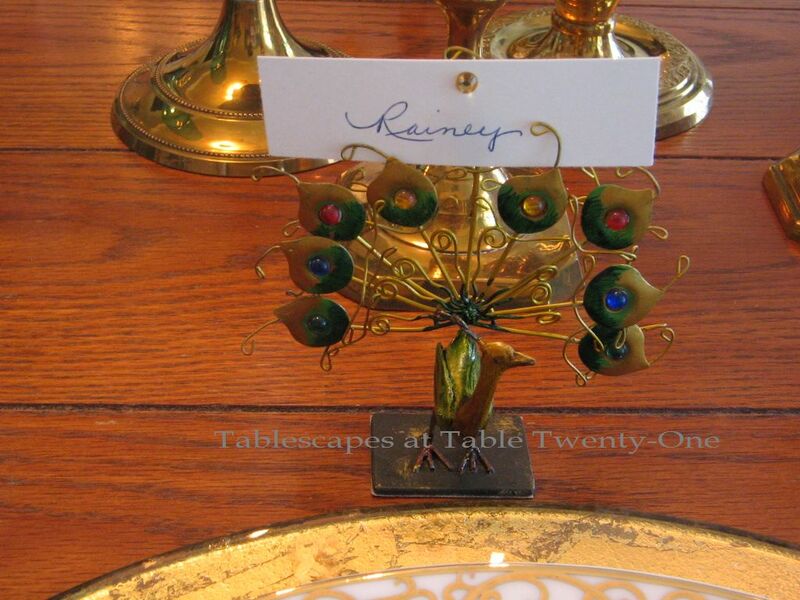 For this occasion, a faux gemstone, like those in the holder, is added to the place card. The peacock feathers I have are 52″ in length and interfered with the light fixture above the dining table. 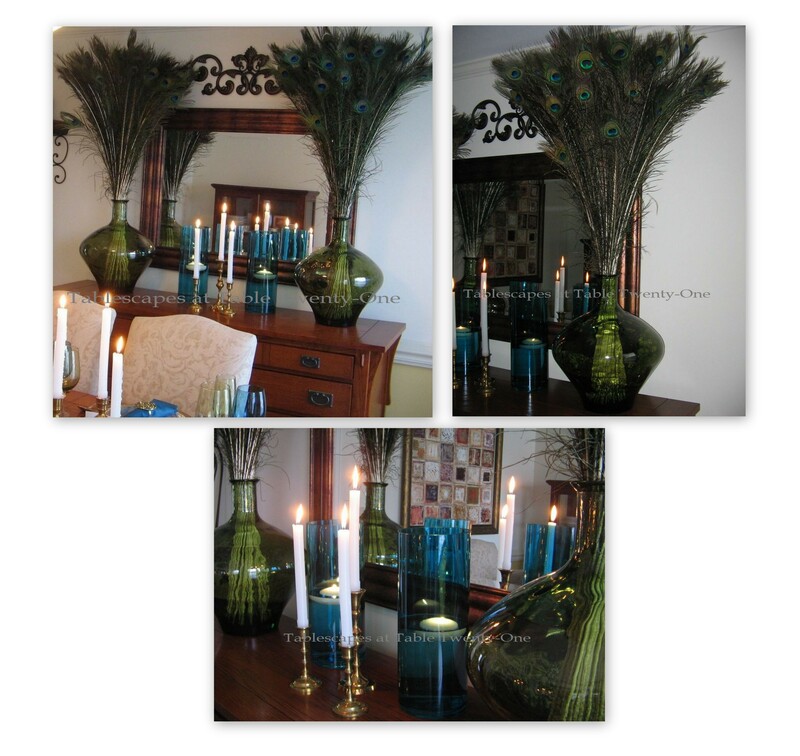 I did, however, want to capture the colors of the feathers in the centerpiece, so I used a single teal glass cylinder with a floating candle centered between clusters of goldtone candlesticks. 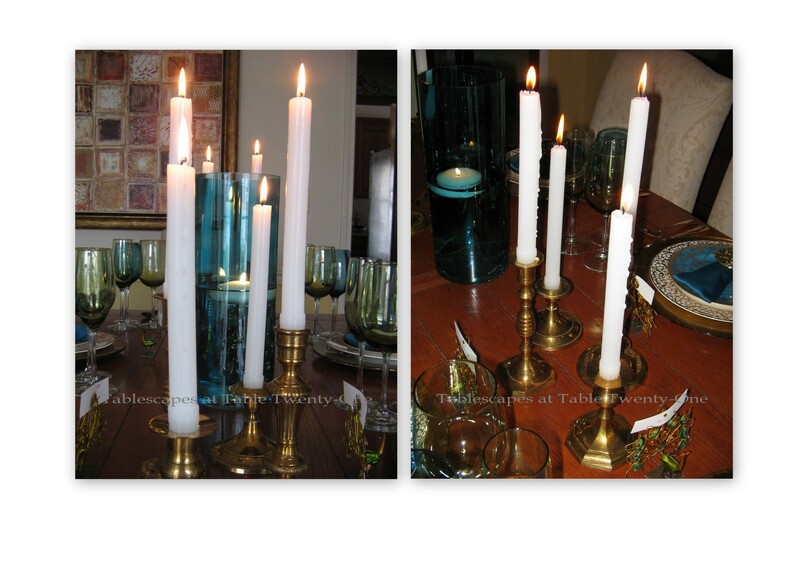 Like the dinner plate selection, white candles were my choice in order to break up the high concentration of deep hues. 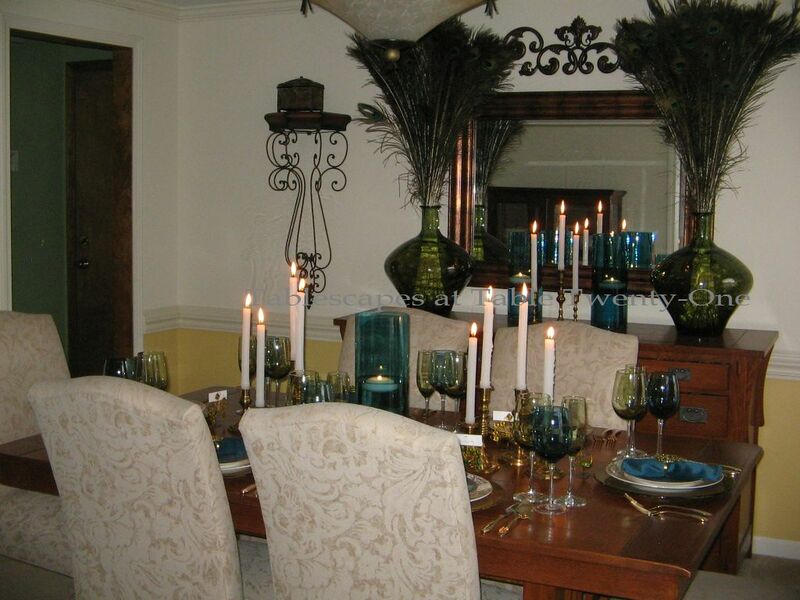 The peacock feathers, arranged in large Vidrios San Miguel green vases from TJ Maxx (also seen HERE), were moved from the dining table to the buffet behind it with a repeat of the teal glass cylinders and goldtone candlesticks. It took a total of 50 quills (25 each vase) to achieve this look. A feather, cylinder, and candlestick display similar to this would look great down the center of a reception buffet table, too! As a side note, I wanted to demonstrate how this table could be easily transformed to a dramatic Fat Tuesday/Mardi Gras look with the simple addition of a mask adorned with peacock feathers at each place setting. This would also make a kickin’ New Year’s Eve tablescape!!! I hope your Mardi Gras celebration is a safe and fun one! When you finally wake up from your hurricane-soaked gumbo coma, please join me for Tablescape Thursday at Between Naps on the Porch! LOVE THIS! Oh my! You rocked this one girl! The colors are wonderful! My dishes are all packed up till next week. We will be in Basehor soon. 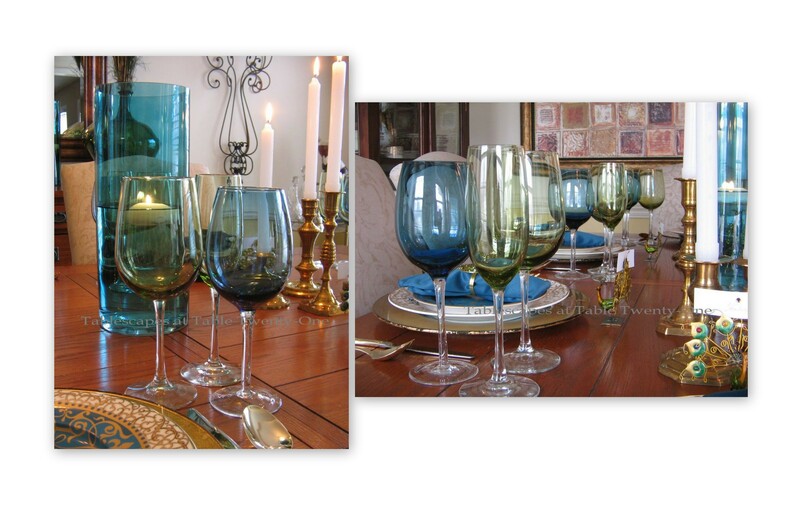 I have the stemware in both colors too. Those napkin rings stole the show! The scroll patterns were a great addition. You are genius! This is another gorgeous table Alycia. I do love it and yes, it would work great for Mardi Gras! Oh my…those colors! Ooohhhh, I love the peacock settings. Such regal colors, well I think it is India’s Bird? So majestic and beautiful! This table is wonderfully creative. It’s great to see how you converted this to a Mardi Gras table with just a few changes/additions. Boy, those peacock feathers are definitely tall! 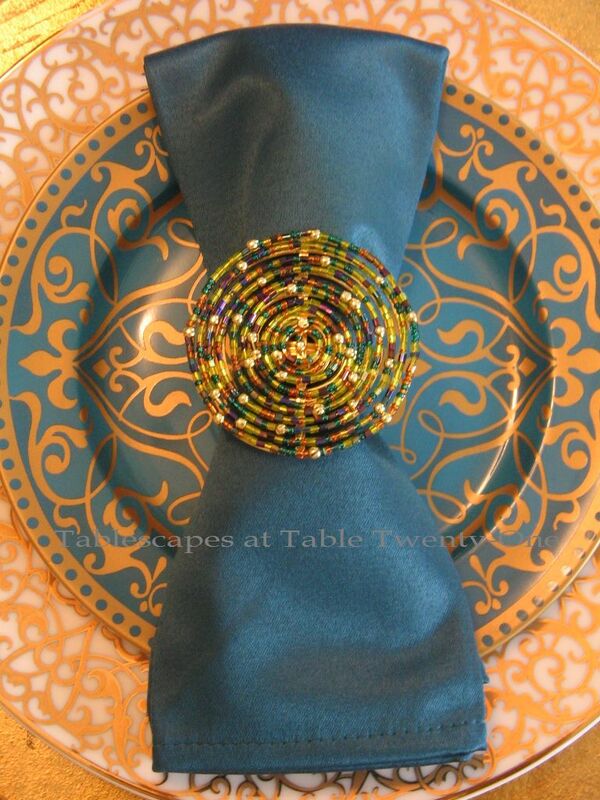 I think the colors of the goblets tie in beautifully with the peacock colors, and those napkin rings and place card holders are gorgeous! I especially love the combination of the scrolled salad plates with the dinner plates. The colors and patterns are beautiful together. You have certainly captured the Peacock’s beautiful jewel tones. I love your gorgeous plates.. The name card is darling and the napkin with the napkin ring is absolutely perfect! It’s great how you added the mask for Mardi Gras. That is an amazing tablescape. So elegant! 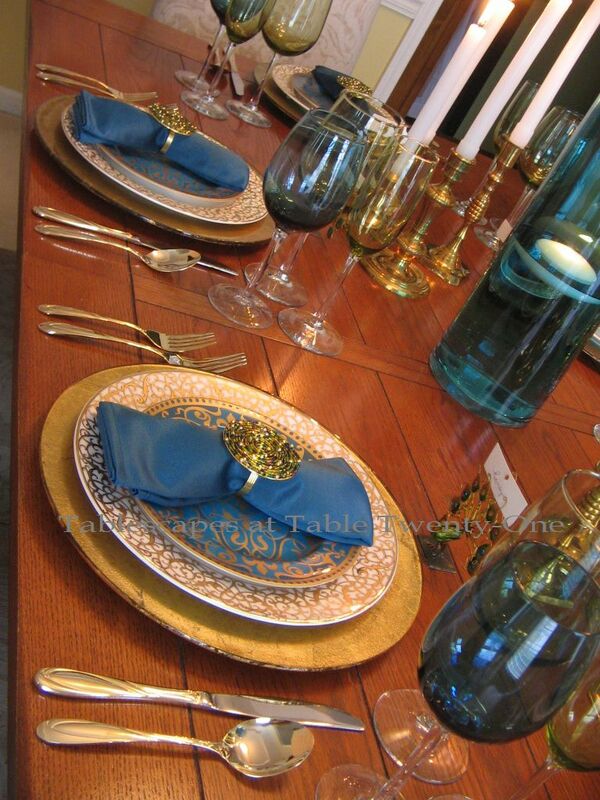 I love the feathers, plates, and those gorgeous napkin rings. Great job! Very pretty! I really admire your tableware knowledge. Don’t know about the foot kissing part, but when it comes to tablescapes, “Your Highness”, is a fitting title. Well for starters the dishes rock! They are beautiful and with the gold chargers their colors show off beautifully! I love how the big green vases on the buffet are a reflection of the stemware coloring on the table. That mask on the plate that is beautiful and it’s wonderful how it brings in that Mardi Gras flair! Your peacock name card holders are a so cute- I’m amazed at the things you have! 50 peacock feathers? Holy wow! They look fabulous in the vases! Gorgeous! Great color choices and Peacocks do have the most beautiful palette to pull from (well at least the males do :)). I want you to compile all your fabulous table designs into a book and get famous, my girl! I love this one for sure. LOVE peacock feathers! The dishes rock! Love the bare wood beneath the dishes to show them off! Very snazzy and well done as all of the scapes you arrange! BRAVO! fun, fun, fun…that’s what this table is, plus beautiful, beautiful, beautiful!! Even the peacock placecard holder–un…be…liev…able…. Some day I want to go see where you store all these beautiful goodies to meet your every whim. Love it all, Alycia! 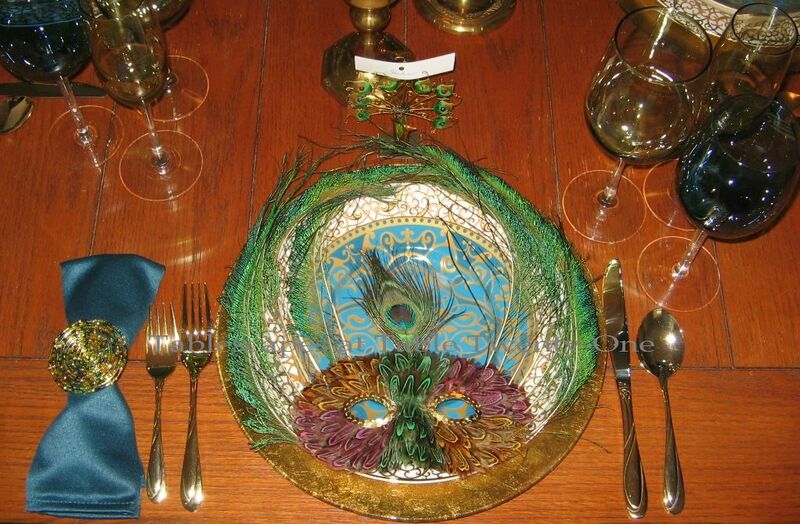 And it was great to see how you “converted” this table to a Mardi Gras one–seamlessly! Peacock feathers are certainly Mother Nature’s masterpiece, and make a stunning theme for your table. And, the gold takes it up another notch to elegant. I love the scrolls in the plates, and I completely agree about the addition of white. It’s that white blouse worn with a black suit. I also love how you increase the impact of the table by repeating elements on the buffet. It’s just gorgeous, Alycia! I am really loving all of the color on your table. For some reason I have been drawn to all shades of blue lately…I love the peacock feathers in your beautiful green vases. They are stunning! I really like how you can change a little and make this setting for more than one occasion. Love it, Love it, Love it! Thanks for sharing and have a great week. I just adore your peacock table! The gold swirl plate and the peacock blue swirled plates are fabulous! How fun to show the addition of the mask. This would be fun for a masquerade party too. Your peacock feathers are so majestic! Wow. Pulling out color from the peacock feathers is terrific! I so often like having nothing under a place setting and here letting the wood be the backdrop for the blue and green tones. This table definitely falls into the elegant category and I will dress appropriately! Love it!!!! This table is screaming!!!! I saw those peacock blue plates and resisted. Now you make me wish I didn’t ! But the star of the show is those amazing place card holders. What a find! Love it all. Great drama. Goodness! What a dramatic settings. I so love the feathery touch. The sallad plate is to die for §:-( they are so beautiful as well as the stemware. Anyhow, I always enjoy everytime, I visit you. So much inspirations to bring me back home. Enjoy your day Lady A and take an extra care. I am in love with that china! The napkin rings are awesome and I simply adore those place card holders!!! I would love to find some! Wow!!! I love everything, especially the way that you mix those gorgeous plates! Stunning…there is nothing more exotic than a peacock’s tail. You’ve captured the colors beautifully! Wow this Tablescape is gorgeous!! !..I really love the peacock place card holders..and by putting the Mardi-Gras Mask on your dishes this was a great Idea…You manage to set the most elegant tables…I would like to thank you so much for your sweet comments on my new Tablescape. I hope you have a wonderful weekend with your family. What wonderful colors, very regal indeed! The feathers are wonderful. The plates are gorgeous! Your tables always have so much drama. Beautiful job, and the napkin rings are outstanding! Good Golly! Now those are some fabulous peacock feathers! Love the pretty color combination. Would make any peacock strut with pride! Love how with just a little tweek of a mask and voila! you have Mardi Gras! Beautiful peacock feathers, & gorgeous dishes. Those would be perfect for Mardi Gras. Thanks for visiting my blog & for your nice comments. Peacock feathers, love that idea (never would have thought of it on my own), simple, elegant and I do like the hint of movement. I love your table, you used my very favorite colors. I especially like the mardi gras setting, FABULOUS :)! Alycia, The peacock theme it awesome. 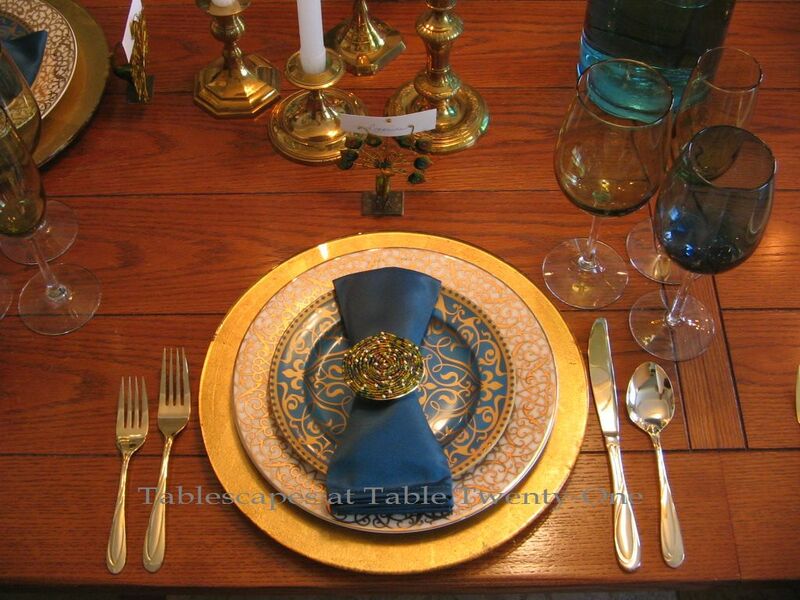 I absolutely love the dinnerware with the beautiful gold, teals, and scrolls. Don’t you just love the Dollar Tree? Someone breaks a glass who cares! You and your guests are comfortable and you are able to create so much loveliness. The addition of the mask was so clever. Love the placecard holders. Breathtaking, Alycia! I adore that deep teal color but I only own CLOTHES in it…no dishes. ??? Hmmmm. The AA plates with all the gold & white were a perfect backdrop for the dramatic salad plates. LOVE all those fully feathers, too! I love the look of the table in its entirety, but my very favorite things are the individual place settings and the place card holders shaped like peacock feathers. Loved that! I can’t wait to see what you’re cooking up this week. Its always so so good to hear from you, its been awhile since I visited or posted anything in the blogland but you are always in my heart, thank you for visiting and for your lovely words really means a lot to me. Your peacock settings are just beautiful I loved it the glasses are perfect colared and the card holders to die for, your table is always elegant and lovely .